We all coordinate one eventually. The dreaded yard sale. Whether they’re actually worth the effort is part luck and part preparation. Here are seven money-making yard sale strategies to help stack the success deck in your favor. Consider going virtual with your yard sale by listing appropriate items online with Amazon. Granted, this isn’t a great idea for damaged wagons or bicycles in need of refinishing, but for good-condition books with a decent resale value, CDs and DVDs as well as things like specific camera lenses and gently-used cell phones, you can liquidate your items at your leisure by setting up a personal store and keeping some shipping supplies on hand. To do it the right way I suggest you check out Adam Backer’s “Sell Your Crap.” It’s a great guide that can help you sell your unwanted things online. It includes 4 ebooks and shows you how to sell your stuff on top online websites such as ebay, Craigslist and Amazon. Traditional poster board signs are all well and good, but placing a neighborhood ad on Craig’s List brings in people other than the ones that drive by the end of your street. It’s all about exposure, and you want to get as many eyeballs on your yard sale information as possible. Free Craig’s List ads are an easy way to do that. As with the Amazon suggestion above, you can also use Craig’s List to support your virtual yard sale efforts by listing items individually for buyers who are searching for specific items. Again as mentioned Bakers “Sell Your Crap.” is a great way to get started on the right path. There’s just something about community yard sale ads that draws people in droves. If you have the ability, consider holding your yard sale with others from your community or cul de sac. When people know there will be multiple sales to shop at, they consider it to be a greater use of their time to make the trip, versus a single-family yard sale that has limited items up for grabs. If you have highly-sought-after items to include in your yard sale, such as furniture, small appliances, vintage china or collectibles, be sure to list them specifically in your advertisement. 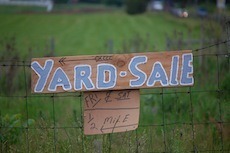 Shoppers like to know there will be more to purchase at your yard sale than simple trinkets and stained baby clothing. A powerful list will demonstrate that to them. If you decide to go with the Craig’s List ad idea mentioned above, then having some photos available of each item will help seal the deal. The higher the price you are asking for something, the better condition buyers will expect it to be in. A quality image will make them feel more secure about making the drive for a previously-unseen item. If you are holding a traditional yard sale, get a leg up on the competition by sorting your items into easily-recognizable categories such as tools, furniture, books and clothing. You’d be amazed at how many people leave everything in a jumble. This makes finding the good stuff much more difficult for yard sale shoppers, which means they’re more likely to just move on to an easier shopping experience. Making their life easier just might mean the difference between liquidating your belongings and being stuck with the same stack of stuff you started out with at the beginning of the event. Are you a yard sale veteran? If so, what are some of your most successful sales strategies?